The present study reports the synthesis and characterization of a new acrylamide-based monomer containing pyridine and 1,3,4-oxadiazole moieties, N-(4-(5-(pyridin-2-yl)-1,3,4-oxadiazol-2-l)phenyl) acrylamide (POPA). The adsorbent resin was obtained by free radical copolymerization of POPA and acrylamide with a ratio of 9:91 mol% in the presence of N,N′-methylenebisacrylamide (MBA) as cross-linking agent. 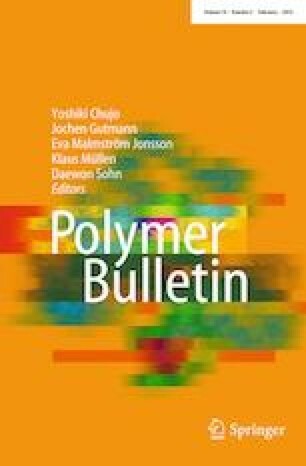 Thermal properties of poly(POPA), poly(acrylamide) and the cross-linked resin were assessed by thermogravimetric analysis and differential thermal analysis. The capability of cross-linked resin to remove Co(II) cations was shown under optimal adsorption time, pH and adsorbent mass. The adsorption kinetics obeyed the pseudo-second-order kinetic equation, and the Langmuir model described the adsorption isotherm with a maximum adsorption capacity of 24.10 mg g−1. In addition, the resin was regenerated by simply washing with 0.1 M aqueous solution of HCl, and no significant decrease was observed in the extraction efficiency following the test of up to eight cycles. The current findings suggest that the obtained resin is a stable and reusable adsorbent that can be potentially applied to water treatments for the efficient removal of Co(II) cations. The authors would like to acknowledge the financial support of the project from The Graduate Council of the University of Mohaghegh Ardabili.